showcasing the productivity benefits through programs like the Ingenious Awards. As a champion of digital adoption, ITAC will be pushing for an improvement in Canada’s annual benchmark ranking against other OECD nations. We’d like to see a move from 6th to 5th place. A simple 1% increase in digital adoption could have a direct $2.5 billion impact on the economy. Enhanced technology adoption also generally leads to reduced environmental footprints for companies. Over the next 30 years, the world’s farmers will have to double food production. Cattle farmers will struggle to meet that demand in a production environment characterized by tight margins, high feed costs, and growing concerns about beef safety, animal welfare, and carbon footprint. Perched in Airdrie, Alberta, just outside Calgary, GrowSafe Systems has developed an animal monitoring system, using Intel Canada technology, with the capability to collect and process massive amounts of data about the health and wellness of every head of cattle on a modern farm. Alison Sunstrum, Co-CEO, says GrowSafe was one of the first organizations in North America to apply the ubiquitous Radio Frequency Identification (RFID) tag—typically found in warehouse inventory management systems—to tracking and monitoring cattle. Although it’s nothing more than “an electronic name tag”, the RFID gave GrowSafe the capability to deploy a range of sensors that could measure any type of factor, including the amount of food and water an animal consumes in a day, its body temperature, even the relative humidity and wind speed of its environment. The continuous monitoring of a cow’s vital signs gives farmers new visibility into the ongoing growth and development of the individual animals. 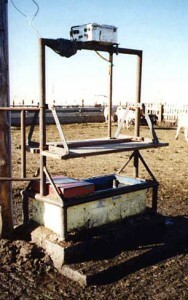 If the system determines that an animal is eating or drinking less, for example, it can raise the alarm and flag that cow for a visit from a veterinarian. It has been shown that GrowSafe behavior patterning can identify sick animals more than four days before visual symptoms appear and 24 hours in advance of a change in that animal’s body temperature. Researchers using the system have also demonstrated that GrowSafe can significantly reduce a cow’s feed intake, and production of both methane and manure. Today, GrowSafe is helping to build bigger and healthier cows in 22 U.S. states, seven Canadian provinces and on farms in Mexico, Australia, Brazil, and Europe. GrowSafe was a 2013 ITAC Ingenious Award winner in the Small to Medium size Private category.